Business buy-in remains a key but elusive factor in the success or failure of Windows 10. If end-users migrate, but businesses stick stubbornly to Windows 7, it could retard Windows 10’s eventual desktop dominance. That’s what makes the report from Spiceworks entitled “Windows 10 Adoption: Sprinting out the Gate” an interesting read. It shows business uptake at the lower end of the size spectrum as surprisingly vigorous and likely to stay that way. Spiceworks is uniquely equipped to tell the Windows 10 SMB story, for reasons I will now explain. 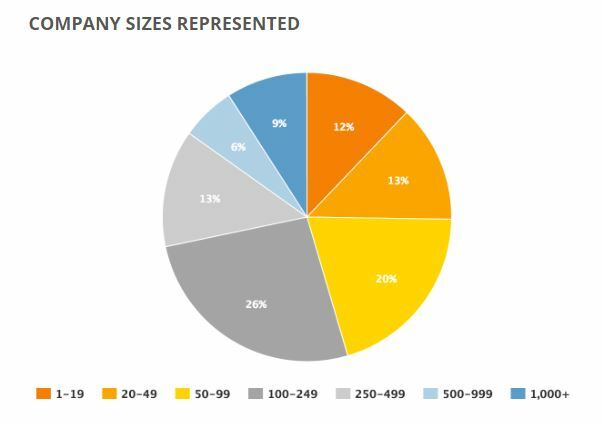 71% of Spiceworks respondents come from companies under 250 employees in size; 91% from companies under 1,000. Essentially, SMB represents Spiceworks core audience. The preceding pie chart shows that, of the 900 IT professionals surveyed, most (71%) work in companies with less than 250 employees. In Europe, SMB means companies with 500 employees or less; in the US, it’s those with 1,000 or less. By either metric, Spiceworks sits heavily in the middle of that range. Thus, respondents work in a sector with a huge number of desktops and devices in use today, likely to continue in the future. In a nutshell, the study reports that nearly 40% of respondents have adopted Windows 10 already. The actual percentage is 38%. Last year, a similar survey projected this number at 40%. Among those companies, 85% report themselves at least “generally satisfied” with Windows 10. Windows 7 is the only other version in use to get a higher satisfaction rating. That group also reports the top implementation issue turned out to be “compatibility issues with hardware or software.” Another key concern was “time required for the upgrade process.” 30% report experiencing bugs in early Windows 10 releases, which registered number 4 out of the top 9 issues. Looking at companies that haven’t yet taken the Windows 10 plunge, one-third plan to adopt in the next 2 years. Of the other two thirds, another 16 percent plan to adopt at some point, and 42 percent have no plans to adopt. This suggests that nearly 30 percent of businesses surveyed (half of the 60 percent that have not yet adopted) are not considering Windows 10 at all. Thus, this identifies a clear target for MS to promote more widespread business use of Windows 10. Overall, the Spiceworks study is well worth a read. Grab a copy and check it out for yourself today. That goes double if SMB is your home sector and your company isn’t already on the Windows 10 bandwagon.